The White Dog Blog: You have GOT TO BE KIDDING ME !!!!!!!!!!!!!! Our Lady keep threatening to do the same to us!!! LOL well if there are treats involved? Have a terrific Tuesday. Duncan - we heard you in Scotland! Well at our house duncan we just rip them off of each other. You need to get a brother to help you out. I thnik since you are a very smart Westie you can find a way to have lots of fun with this one. Just think........sliding across the floors... knocking over stuff as you slide by. Duncan...... For DAWG's SAKE... do NOT be tricked into this new type of HORROR... STAND YOUR GROUND buddy... Withhold Kisses and Cuddles if necessary. OMD…. She HAS totally lost her mind! OR maybe some alien has taken her mind in a mind meld thingy or somethin. Run da other way if her eyes start to glow. Oh no! Will she not negotiate? HOLY COW PATTIES!!!! Duncan, has she lost her ever lovin' mind????? DOGGIES helpin' with the cleanin'???!! NO!!! We GET it dirty...we don't CLEAN it!! Geesh. From our experience, if there are humans and work involved,d there are no treats. Sorry, Duncan. She has a new helper. Don't give my momma any ideas. 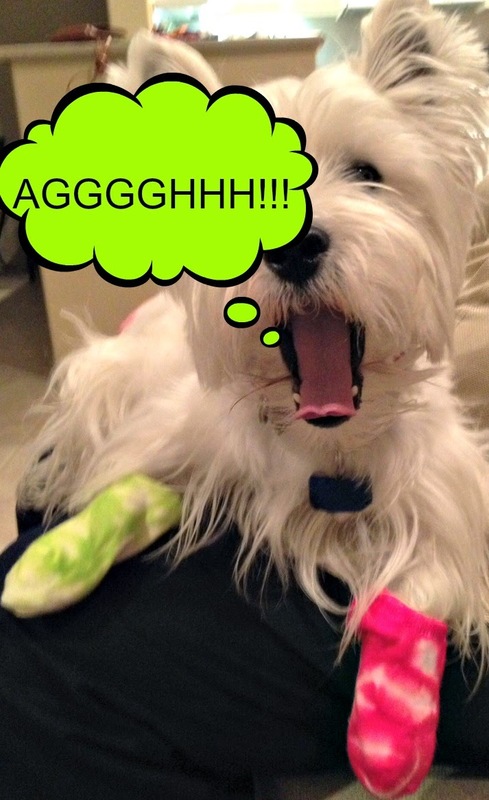 Duncan, best you get those socks off and chew them to pieces or hide them someplace very safe. I hope Mommy doesn't get any ideas from this. There better be REALLY GOOD treats involved!!! Cool paws slippurs Duncan...says my little girl Frisbee the Westie wiffs an attitude!